EZ-Gro Magnesium (Mg) 6% 9-0-0 is a plant nutrient supplement powder, which exploits amino acid chelation to enhance its bioavailability. Magnesium is an important element that is crucial for photosynthesis, however it is often overlooked in terms of plant nutrition. It is especially sensitive to yield dilution, resulting in decreased soil levels in subsequent growing seasons. The exogenous application of magnesium to deficit soil can enhance root formation, chlorophyll synthesis and photosynthetic rate and efficiency. 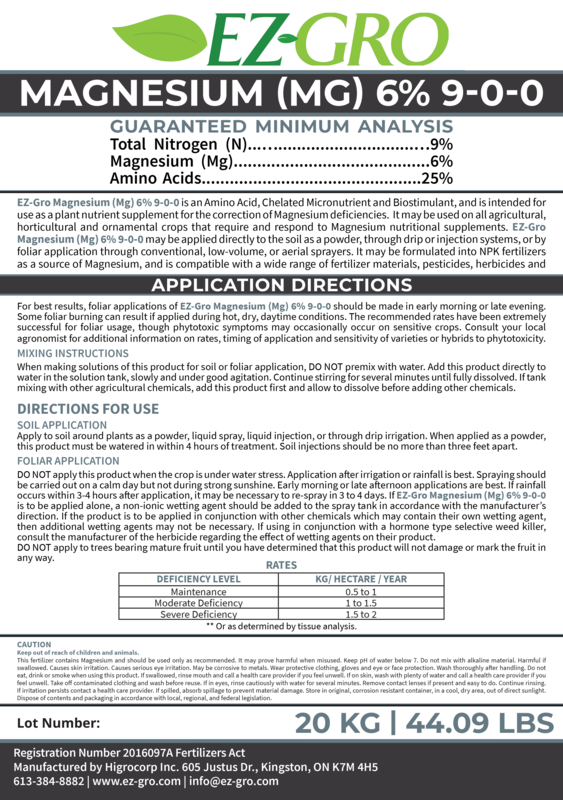 Add EZ-Gro Magnesium (Mg) 6% 9-0-0 to your current fertilizer regimen to remedy magnesium deficiencies and boost growth, yield and quality of your plants.